The JW Marriott Grand Rapids is everything you would expect and nothing you could have imagined. Situated in the heart of downtown Grand Rapids, Michigan, the JW Marriott Grand Rapids is meticulously designed for both business and pleasure. 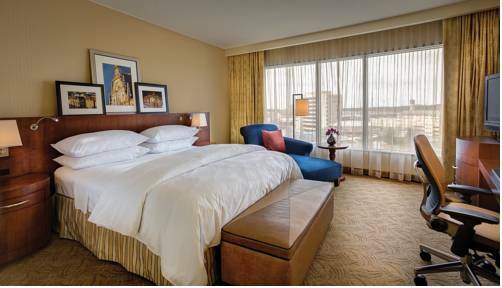 As the first JW Marriott hotel in the Midwest, the hotel offers 337 well-appointed, smoke-free rooms and suites on 23 posh floors. Each of which is outfitted with atypical amenities like a 42" LCD TV, as well as numerous other uncommon personal luxuries. From shareholder's meetings to lavish wedding receptions to intimate weekend getaways to The Spa, the JW raises the bar. In luxury. In service. In dining. In everything. Six.One.Six Restaurant: Classically trained and a native of Italy, Chef Alessandro showcases a masterful, creative command of raw ingredients and a palatable confidence evident in every dish.